Like any proper geek, I like to play with tech gadgets and tend to burn through a lot of different pieces of hardware in rapid fashion. 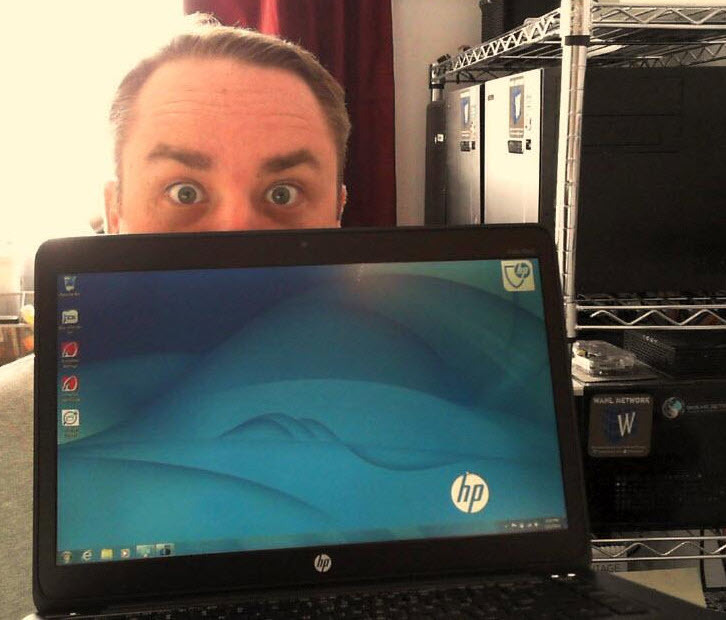 So when HP asked if I would be interested in spending some time with their new EliteBook Folio 1040 G1 (quite a long name!) to provide feedback, I immediately said yes. 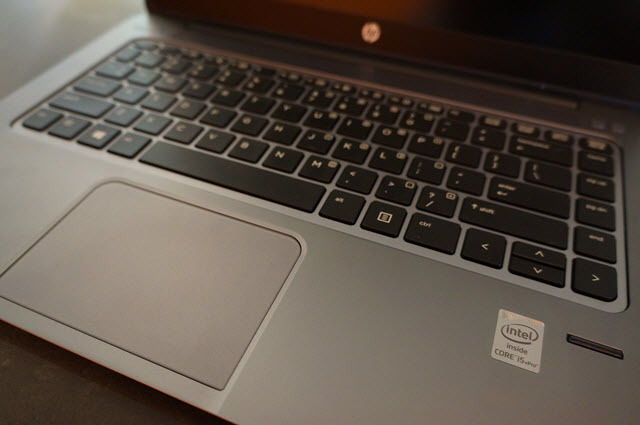 The last laptop that I reviewed was my trusty HP Spectre XT TouchSmart Ultrabook 15 (also a long name), which I still use today, and it seemed to be of value to a lot of folks. And so I’m going to write up something similar here for your viewing pleasure. Do you want to see anything specific on this unit? I will be releasing a video on my YouTube channel over the next few days. Leave a comment on whatever you want to see (boot time, how the finger swipe works, etc.) and I’ll see what I can do to include it in my video. Disclaimer: HP provided me with a review unit which was used in this post and in the upcoming video. No other consideration was requested. The left side of the laptop features a USB 3.0 port, a Micro SD slot, and a Smart Card (SC) slot. 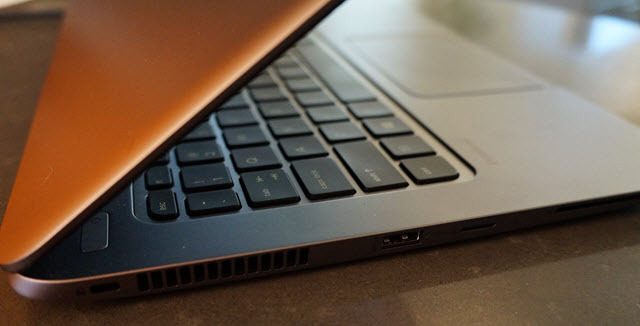 The right side of the laptop provides an additional USB 3.0 port, DisplayPort 1.2 slot, 3.5mm headphone jack, side docking connector, and power input. There are certainly trade-offs to this configuration. On the one hand, this is one less USB port than I’m used to, and there’s no network adapter. However, my typical USB connections – charging a device (like my phone) and connecting a USB thumb drive – still works fine with the two ports. I can pop in a Bluetooth mouse for longer periods on the laptop (assuming I’m using the other two USB ports). As for networking, I can use the built-in wireless A/B/G/N in lieu of a physical network adapter, since wired networks are rather rare in most cases when traveling. 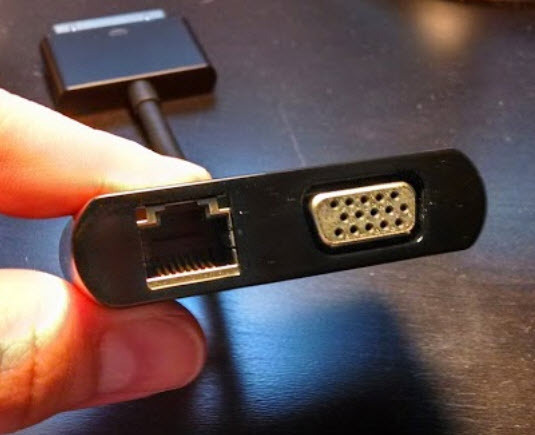 If you plan to use this for field work, you might want to get a USB-to-Ethernet adapter or use the included breakout cable (picture below). But I don’t think a wired connection is all that relevant for most folks these days, outside of edge cases. It was time to take the EliteBook 1040 G1 on the road. I had great success using this bad boy while traveling in a metal tube at 500 MPH (hint: airplanes). Most seat backs bump up against the lid of a laptop of any significant size, but this EliteBook is able to open up to a comfortable viewing angle without nudging the seat in front of me. For me, this is huge. I don’t find tablets to be good enough for a flight and don’t want to own a cheapy little throw-away laptop that is just for zipping around in the air. The screen is extremely crisp and clear looking. Measuring about 14 inches with a resolution of 1080p (1920 x 1080), I found myself able to cram a lot of content into the display – although I do somewhat envy those retina displays on other laptops. Over the years, I’ve transitioned from a laptop that had a rubber nub in the middle of the keyboard, to ones with paddles for the left and right click, and now on to smart touchpads. 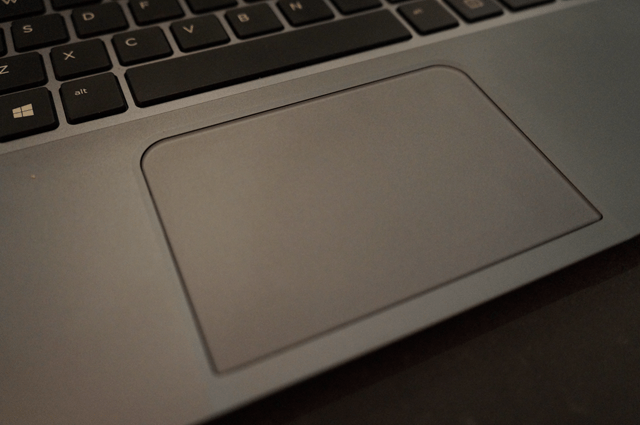 The EliteBook 1040 G1 features what they call a multi-gesture touchpad. It works using the pressure in your hand and a series of different swipes with various quantity of fingers. I found it somewhat clunky for the first few hours as my hand learned the gestures, but once my muscle memory was up to par, it was very close to mouse performance. I’m a big slave to a mouse, so this was a new experience for me. The touchpad is big and multi-gesture enabled. While using the touchpad, you can press a little harder with one finger, or add the touch of a second finger to tell the OS what to do. This enables fun things like single-finger click and drag support (without having to lift your finger), the ability to do pinch/zoom activities like you would on a tablet or phone, and other multi-finger swipes and clicks. Overall, I found it a very nice feature that I sort of already miss when switching back to my SpectreXT. The battery is rated at about 9 hours of “balanced use” with the HP power policy. I found that my usage was more about 6 hours, which is still excellent considering that I’m on the screen “doing things” constantly for that period of time. The laptop never made noise or grew hot. I found this mysterious in an awesome way. Where does the heat and noise go? Meetups with missing socks, perhaps – we may never know. I gave the laptop to my spouse, Jen, for a week. She creates and edits video, audio, and does all sorts of intensive multimedia work on an older model HP EliteBook 2560p. As such, I thought she’d be able to provide valuable input on this newer model. Out of the box settings need to be adjusted for working on a mass storage device. The default setting is to disable access to storage devices after 15 minutes – there is no prompt to keep you connected before terminating the connection, so fix that or lose changes. If you’re using a mass storage device – like a USB 3.0 external hard drive – make sure to change this setting. Probably not a huge deal for the vast majority of folks, but if you’re constantly sending/receiving data from the USB ports, heads up. Plugged in and unplugged light use (word processing, web crawling, etc.) very quiet, no noticeable heat. I’ve done some heavier lifting with it both plugged and unplugged and found the same to be true. One of the best features on my EliteBook 2560p was the extended battery so I could edit and process video for hours (at least 4, probably more) without an outlet. High praise, HP, and well done. Want more? Check out some other superb reviews written by my colleagues: Absolutely Windows, Chip Chick, Gear Diary, Techazine, and GeeksRoom (in Spanish). When we talked at the last HP Discover, you had a lot of great comments about your latest laptop. I’d like to know all the same. Battery life at full power, How it performs as a workstation and lightweight portable powerhouse. CPU configurations, max memory and HDD options as well as cost. As usual, whatever you do will be fantastic. I have one as my work laptop. My main gripe is limited to 8GB RAM and a maximum 265GB SSD which is a bit limiting. There is an ethernet/vga adapter available too. Good point, and I have the little breakout adapter but neglected to include in the post – I’ll make sure it gets added to the video. I have 4 GB of RAM in mine (and in my SpectreXT) which seems like plenty. But if I wanted to run VMware Workstation for a mobile lap, I’d probably get something with a lot more RAM.